I will be talking about my past experience with PHLPost and customs, so if you want to go straight to AliExpress, just scroll down below. For the past several years, I avoided having items shipped through PHLPost whenever I can to avoid customs inspection. Customs here in the Philippines is notoriously corrupt and there are a lot of horror stories of people getting charged absurd tax rates. Just google it and you'll see there are no shortage of angry anecdotes online. I do have my own unpleasant experience myself. Some years ago, I bought eyeglasses at some website based outside the Philippines. The price was cheaper than what I would usually get here (that includes getting the thin lenses and having it multi-coated). At the time, I previously purchased a few items internationally. I did get taxed but it was was somewhat reasonable (I can't remember exactly, but it was less than half the parcel price) so I expected I the taxes I have to pay would be about half the total purchase price at the most. When the package arrived, the tax I got charged with was even higher than what I originally paid for. I ended up not getting the item so it was sent back and the seller kindly issued a refund. Since then I just use forwarders like Pobox.ph that will deliver the items straight to my door. Not only this saves me the trouble of picking up my parcel, but more importantly I know the fees that I have to pay beforehand and I won't get charged for additional anything once it arrives. Air shipping with forwarders can get expensive, while the sea freight option is a lot cheaper but also slower. That excludes books though. Books aren't charged tax (due to the Florence Agreement, as long as you are buying 6 or less of the same book), so I just have them shipped normally. I'm not sure if magazines are included in this, but I also purchased a magazine together with two books at YesAsia last year and it was also delivered straight to me. But if you must know, there are people who still gets charged "tax" on books. There was even a case that got viral last 2015, wherein someone got charged tax for the Harry Potter book set (since it has a total of 7 books and the customs employee insisted that all the books in her set are just the same). Submitted in 2015 but finally implemented last October 2016, The Bureau of Customs has increased the de minimis for imported goods from 10php (around $0.200 dollars LOL) to 10000php (around $200). That means imported goods under 10000php are not subject to duties and taxes. Products like tobacco, wines and spirits are still subject to excise tax even if they are under the de minimis. I decided to give this a whirl by buying items from AliExpress and from international eBay sellers last month. I've always wanted to buy items from AliExpress because there are a lot of cheap items. Before someone lectures me on the effects of fast fashion, please keep in mind I live in a country where the wages are one of the lowest in the world and while buying dirt-cheap goods just help perpetuate low wages, its not something that can be fixed overnight so it's not like I'm gonna walk around naked or stop buying stuff in the meantime. Anyway, I bought three items on AliExpress and two items on eBay (all different sellers) last 23rd December 2016; and I got a notice from the post office last 11th January and 16th January. One of the items purchased through eBay was delivered straight to my house. All of them were posted out with the (supposedly slow) free shipping option but they all came in less than a month so it wasn't that long. The cards that I received from the post office had an instruction on it saying that I should bring copies of the invoice of my purchases although I wasn't asked for it when I picked up my items. You need to bring a valid I.D. though. While the items aren't charged tax, all items held in the post office are still subject to a storage fee. I've read somewhere that the storage fee is 100. I was indeed charged 100 php per parcel, but there was an additional VAT charge so for four parcels the total was 448 php. I asked them what is their basis for holding items at the post office. It probably isn't the parcel weight or price, as the parcel delivered directly to me was heavier and higher in price than some of my other purchases. All they said was it was the custom officer's discretion on which parcels gets delivered directly and which ones gets held. 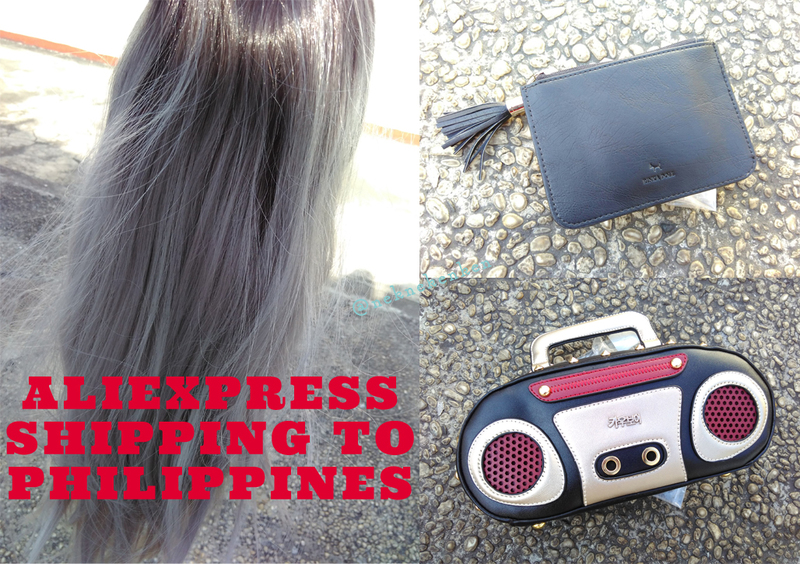 While it still bums me that I have to pick up parcels at the post office as the one located nearest to me is still out of the way (and there is always a chance that you have to pick it up at the main PHLPost office at Pasay) I am somewhat more confident in making small purchases online since I don't have to worry about paying additional duties and taxes anymore. The wig was slightly better than expected. I've bought cheap wigs before and they were thin, made out of shiny synthetic hair and shed a lot. This one is somewhat thick and the hair texture looks natural. My only complaint is the hairline looks unnatural and obvious but nothing that can't be fixed by using a cap or by lowering your standards. If you've got sewing skills perhaps you can tweak the hairline. The black coin purse is just a regular coin purse. Nothing much to say really. I almost didn't went through buying the radio bag. Counterfeit items are all over AliExpress, and they don't place in the brand name (to avoid getting caught maybe? or maybe to not discourage buyers) so if you don't know the design you might be unknowingly buying counterfeit. I tried searching if this radio bag is a counterfeit of some other bag but I can't really find another one similar (apart from other sellers selling on AliExpress and some standalone online fashion stores selling stuff sourced from AliExpress/Taobao). The bag itself was great and the size is perfect. Well, to be honest, that was an awesome challenge from the customs to at least try and fight corruption. Online sellers who want to try and sell some of the goods from the biggest e-commerce sites in the plan. Just to be safe, choosing high quality airfreight services should always be a priority to answertheses kinds of problems.